We are advanced trained storm spotters. 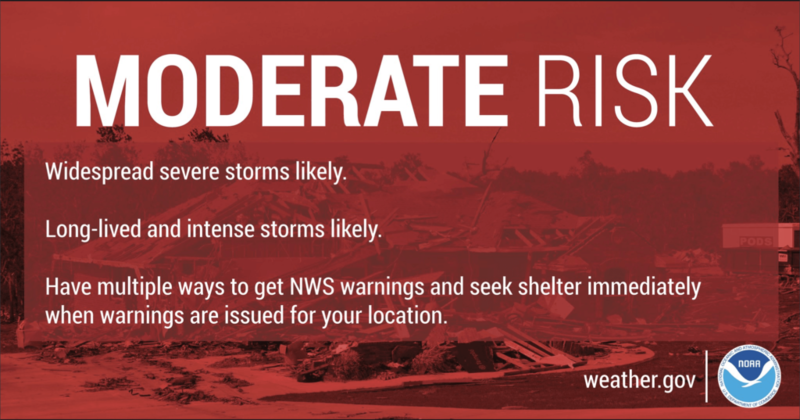 Summary: Moderate risk of severe weather this afternoon and evening, with all modes of severe weather possible (large hail, damaging winds, few tornados). Today is one of those very rare and unusual severe storm setups mainly because of the time of year it is. We normally don’t see this type of a setup in July –normally these are reserved for the spring. But we have a risk of severe weather today, including very large hail, damaging winds, and some tornadoes. Let’s break down what that means for today. The Storm Prediction Center (SPC) has placed us under a Moderate risk for severe weather. That is a 4 on a scale of 0 to 5, with 5 being the worst. 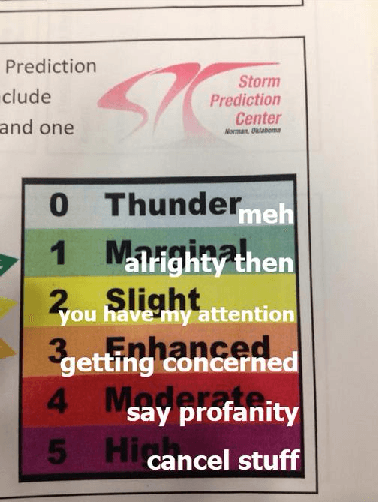 Now that you’re up to speed on what a Moderate risk of severe weather is as defined by the fine folks at NWS, let’s break down our particular threat today in categories provided by the SPC (from greatest risk to least risk). 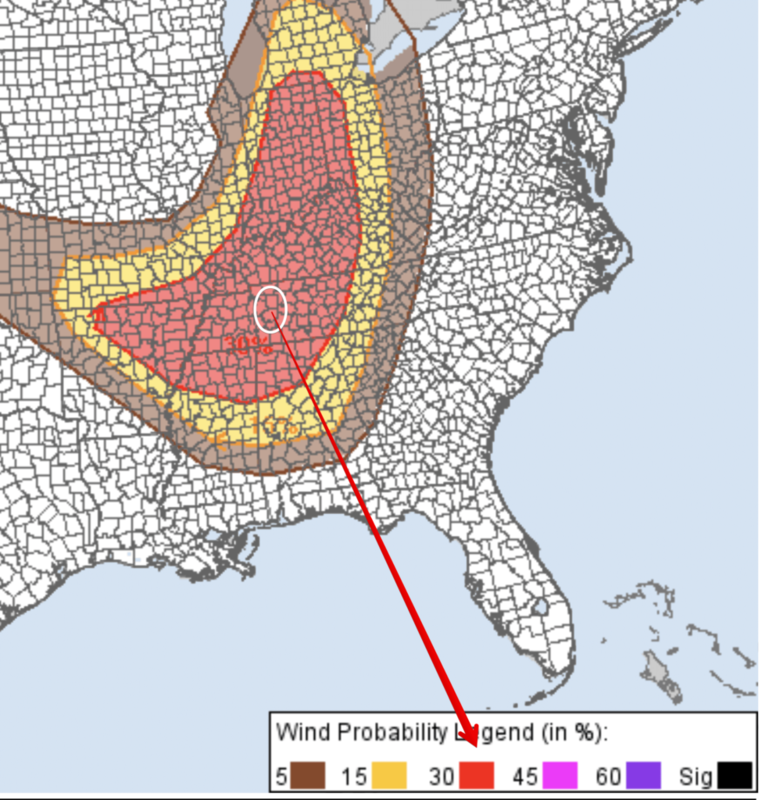 The SPC has outlined both counties firmly in the 30% chance of seeing damaging winds of 58+mph or greater within 25 miles of a point. This is the biggest threat today due to the potential for widespread damage. 80+mph winds are not common for the mid-state (outside of a tornado). They can cause large trees to come down, structure damage, and if you mix hail with it of any size (especially the golf ball size hail predicted for today), you’re talking about a very real possibility of significant damage. If these winds come through your neck of the woods, I recommend treating it like a tornado. Take shelter away from windows because those winds could make anything come through your windows. If you are in a mobile home, find an alternative place to be. If you can, go to a friend or family member’s house if it is not a mobile home. If you have absolutely no place to go, do your best to leave early enough to make it to a business where you can ride out the storm there (avoid big-box retailers like WalMart or Kroger, but instead go to a business in a strip mall or a restaurant). These buildings are much safer than your mobile home. Preparations: Know your safe spot and give yourself adequate time to get there. Tie down or bring in any outdoor furniture you don’t want to be blown away or damaged. 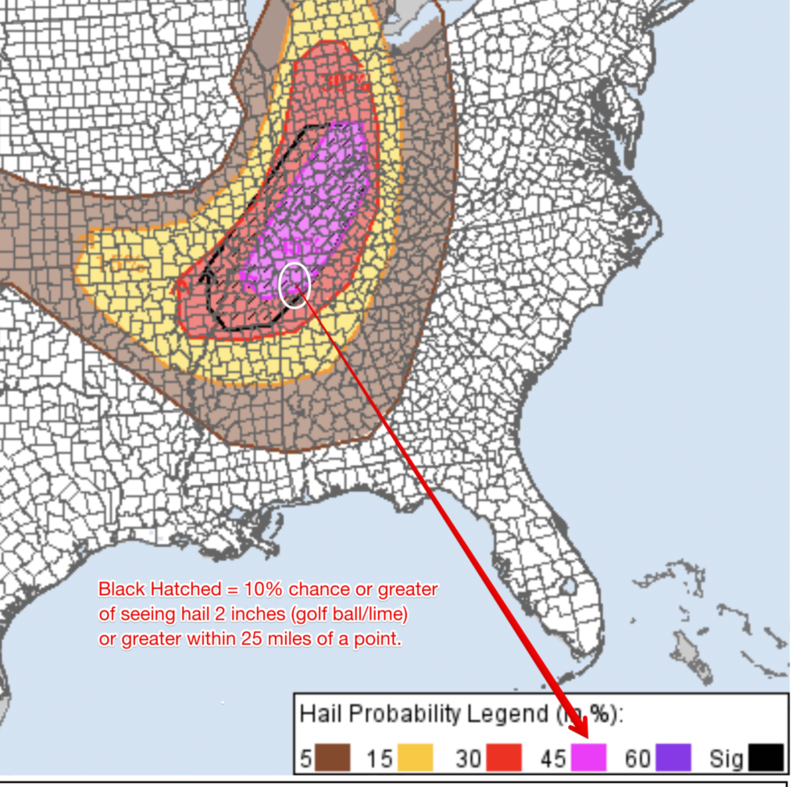 The SPC has put us in the 45% chance of seeing hail 1inch or greater within 25 miles of a block (purple area). You’ll see in the image above that there’s a black circle with hashes in it. This is the SPC letting us know that they expect within that area to have larger hail. Thus, the hatched area means 10% or greater chance of seeing hail 2 inches (golf ball/lime) or greater within 25 miles of a point. The larger hail sizes (2 inch or greater) will be possible if we get supercells storms and you end up underneath one. The storms will have to be pretty severe to reach this size, but it is entirely possible today. Hail of 2 inches is going to do some damage. If you’re under a storm dropping this hail, you could see some broken glass on windows on your cars/houses, damage to anything outdoor (including your roof and cars), and your pets/outdoor animals are definitely not going to appreciate it (it will hurt them significantly). Preparations: garage your cars if you can, bring outside pets in or make sure they are sheltered, cover or bring in anything you don’t want to see damaged. 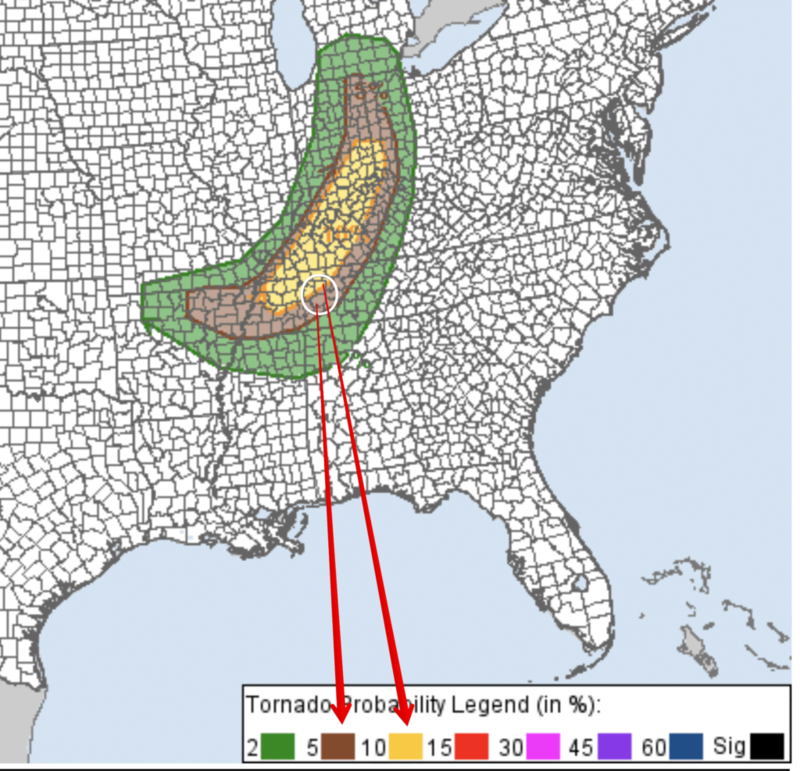 Our tornado risk is an elevated one but comes third in the hazards for today. 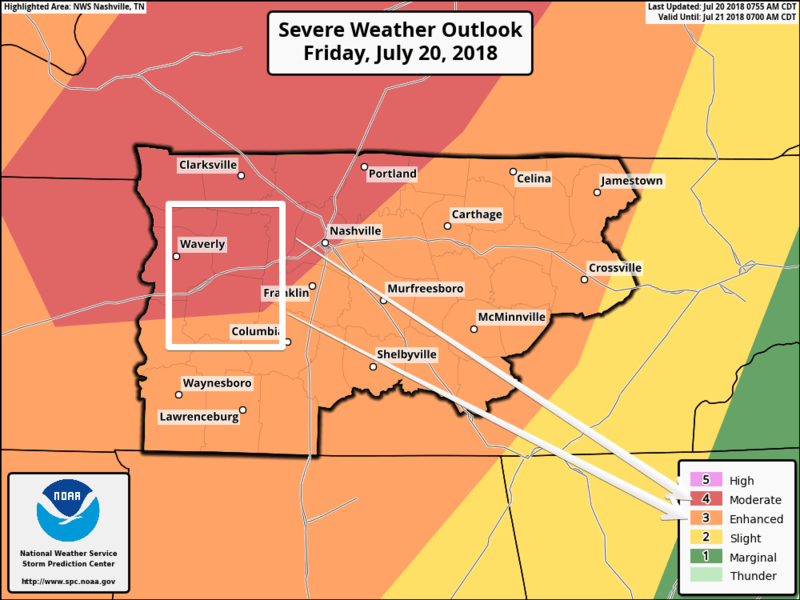 Dickson County is in the 10% chance or greater of seeing a tornado within 25 miles of a point, whereas Hickman County is in the 5% chance of seeing a tornado within 25 miles of a point. Like I mentioned, storms (and tornadoes) don’t stay within these human-drawn boundaries, so for the sake of brevity today, I’m treating both counties as if they are in the 10% chance of seeing a tornado. Preparations: Know your safe spot and give yourself adequate time to get there. Make sure your safe spot is prepared with essentials (read here), charge all phones, and put blankets and pillows in your safe spot well before the storms. The current forecasted timing is between 2pm and 2am for the mid-state, where our timing is roughly 3pm to 8pm, give or take an hour or two. The timing for these storms is still a bit uncertain between weather models, but afternoon into evening into overnight is the best window for the severe weather. So, as NWSNashville says, the confidence in timing and placement is low. The HRRR model is the one we are watching right now, as that is the most short-term, rapid refresh model we have to use. Below is an animation of what the HRRR model thinks will happen starting at 10am and going to 3am. *Take this with a grain of salt* These models are meant to give us a general idea of when the storms could here, NOT the placement of the storms. Placement of storms and timing of storms still remain uncertain throughout the different weather models, which is why our confidence in timing is and placement is low. But could it bust like previous Moderate risk days? For those with pretty good memories, we’ve had a few of these Moderate risk days since the infamous tornado outbreak of December 23, 2015, all of which have busted. Saying it “busted” is always something that happens after the event is done and we evaluate what happened vs. what we forecasted. I never go into an event thinking it is going to bust. EVER. And neither should you Why? Because it lets our guards down, and that’s how people start getting caught off guard or even worse, hurt. It’s much more important to focus on the threats that exist and take the precautions and treat it seriously. Thinking about a forecast “busting” should never be part of your decision making on if you should be taking it seriously. If we are saying you should take it seriously, then please take it seriously. Finally, if it does bust, count it as a blessing that people weren’t hurt and that their lives haven’t been turned upside down. Now with my rant out of the way, let’s discuss what *could* make this event bust, and what my thoughts are on it. Convection (rain) in the early afternoon hours. *If* rain were to start developing at or around lunchtime and throughout the afternoon, this could help stabilize the atmosphere a bit for later storms. Basically what this means is that the earlier rain could “eat up” most of the storm fuel (instability, or CAPE for the weather nerds), leaving little for later storms. Those later storms then won’t have much to feed off of when they get here, meaning they won’t be able to grow much and could even start weakening. Do we think this is going to happen? Not really. Models are showing not much in the way of rain/storms before the main line of storms come this way. 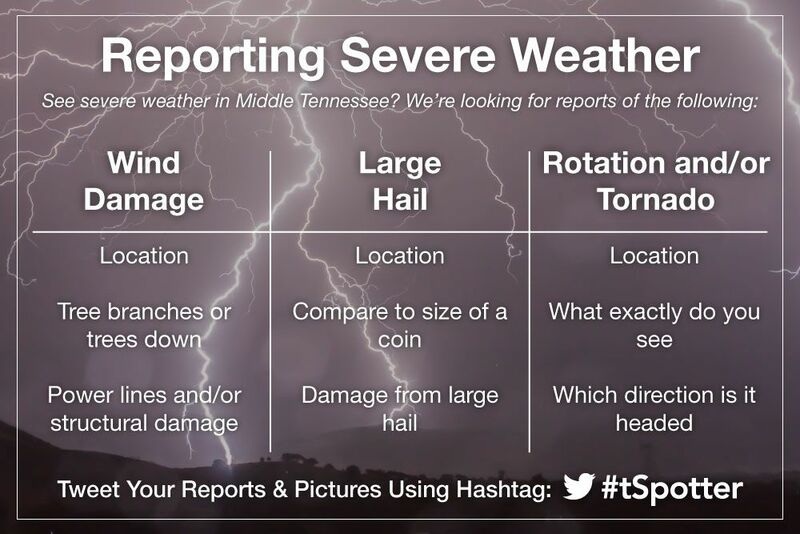 ONLY if you can do so safely, we and NWSNashville would appreciate your reports on Twitter using the hashtag #tSpotter. Here’s what we’re looking for today. Today is one of those days where panicking isn’t going to get you anywhere, but preparedness is going to help you substantially. 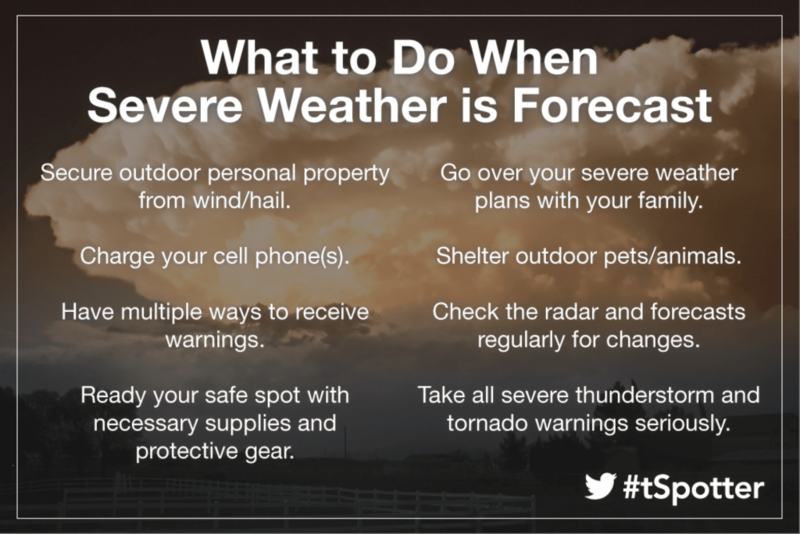 Follow your trusted weather sources and stay weather aware today as the storms come through. 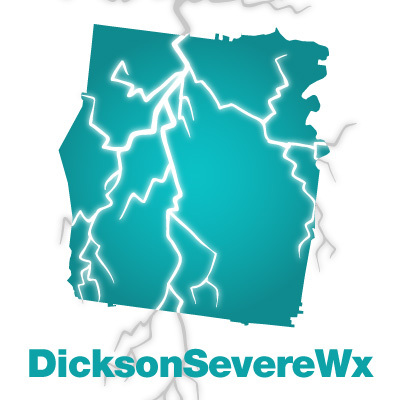 Follow me on Twitter @DicksonSevereWx. In-the-moment updates will NOT be posted to my Facebook page.